Skinny Gourmet Guy: Roasted Sea Bass! I want this for dinner every night! I love roasted sea bass - where you have the fish monger clean the fish, but leave it whole so you can roast it that way. I order this all the time at the restaurant Vai on the upper west side. I asked the chef how he prepared it. He grilled both sides of the fish and finishes it in the oven. The waiter will present the whole fish at the table, then take it to the kitchen to filet. They always come out perfectly. My sea bass is delicious, but can end up looking like the dog's breakfast because it always falls apart when I try to filet it after cooking. Then I saw a video on the NY Times on line site. They say not to worry about it looking perfect. I gave in last night and stopped trying to be such a perfectionist. It didn't look all that bad - and it was delicious! You can infuse the sea bass with whatever flavors you feel like using. I chose fresh oregano, tomatoes and lemon slices. There's a world of difference between fresh and dry oregano. 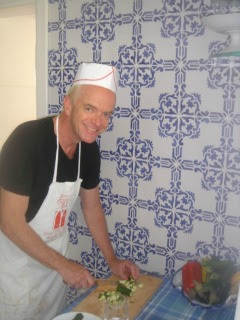 The first time I came across fresh was at a roadside stand on the Amalfi coast. Citarella has it and that's where I purchased it yesterday - it was only $1.99 for a package. It's also important that you use plenty of salt and pepper inside and out the fish - the bass will stand up to it and the seasoning really brings out the flavor. I've mentioned this before, but it bears repeating: always act as your own sous chef and get all of the ingredients ready and have them handy before you start to cook. I'm so much more relaxed that way - and prepping all of the ingredients is a ritual. Why not enjoy a glass of wine while you chop? When choosing a whole fish, always be sure to look to see if the eyes are clear. Take a sniff - it shouldn't smell "fishy." It should smell fresh and you should detect the sea - otherwise it's not fresh. I have roasted fish by placing the ingredients inside the cavity and sealing it shut. Last night I let the ingredients peek through - they seemed to cook better that way. The fish really took on the delightful tastes of the fresh tomato, lemon and oregano. Once you've place your ingredients in the cavity, put the fish in a pre-heated 400 degree oven for 15 minutes. Meat in the cheeks is the best - two tiny morsels of deliciousness! Dig away a serving from the bones, top with the stuffing and enjoy! While my dish wasn't as pretty as the one served at Vai - it was just as delicious. I've even seen this served at Eataly whole and the diners picked away the flesh from the whole fish. I like to prepare in the kitchen - but it's up to you - serve whichever way you like best.